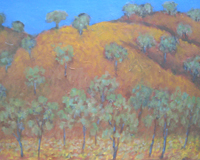 Chroma Australia - artists' paints manufacturers. To find the heartbeat of Chroma Australia I travelled the steep, winding mountain road from the coastal town of Port Douglas. Up and up we twisted and climbed, magical scenic glimpses of the plains and turquoise ocean below appearing through breaks in the jungle. In a relatively short time we were there. Set in a beautiful, rambling garden, complete with tropical orchard, paths that wander over a clear creek, through ferns and a profusion of wild colour, is Jim and Josephine Cobb’s relaxed home. 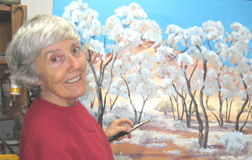 Josephine paints one of her inland scenes. 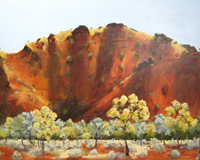 Both Jim and Josephine are highly experienced landscape painters, who explore the rich colours and tones of the outback with stunning results. 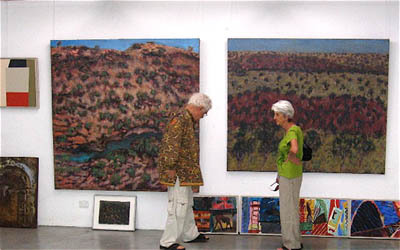 Painting side by side "en plein air" they nevertheless have evolved completely different styles, using both oils and acrylics. 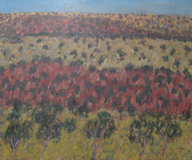 It is obvious from their prolific and expressive paintings that Australia, the "wide brown land", in all its moods, is much loved by this pair of innovative and highly competent artists. Chroma Australia is their very successful paint manufacturing business. The buildings scattered through the garden form their retreat and inspiration, their place of work, their gallery display and Jim’s experimental laboratory. Here he develops remarkable recipes for paint and mediums that are transparent, opaque, shiny, matte, rough, smooth, fast drying, slow drying, of intense colour or muted … in other words, paint that can do anything a painter desires! Since that first visit to their home, six or seven years ago, I have been fortunate to visit Jim and Josephine on many occasions. 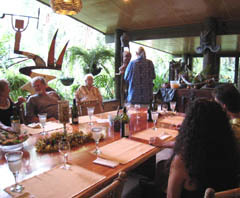 Their expansive hospitality has usually included groups of friends, enjoying lunch around their huge table, which seats fourteen with ease! 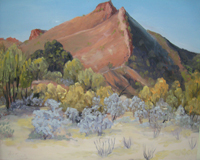 MacDonnell Ranges near Alice Springs by Josephine Cobb. Their paint manufacturing business has its main factory in Sydney, so Jim and Josephine commute from Port Douglas as well as visiting their various, rapidly expanding markets overseas. I find it fascinating that, by perseverance and persistence, from humble beginnings and with no outside financial help, Jim has developed his business into an export situation, with outlets in Australia, Europe, Asia and the United States clamouring for his superior products. The range includes Archival Oils, Atelier Acrylics as well as Jo Sonja acrylic gouaches and the various mediums which extend the range. Absolut Matt and Interactive Acrylic are popular, fairly recent additions. Who knows what Jim will dream up next to delight us all? 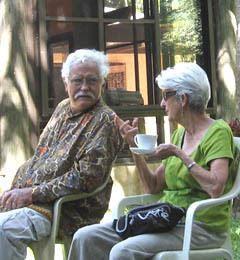 Footnote: It is with sadness and regret that I note that in October 2010, after a short illness, Josephine passed away. Her family and friends will miss her greatly as will artists, to whom she was a generous teacher and friend. In 2012 Jim moved to live in Sydney, where his business interests are. 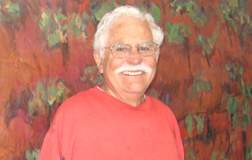 February 2015: See this interesting article about Jim Cobb's life as a paint manufacturer and philanthropist. 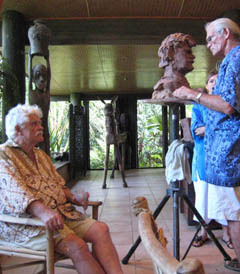 Aden McLeod works on a clay portrait of Jim.